You are here: Home / News / Newsletters / Conscious Meat Eater – what does that mean? Conscious Meat Eater – what does that mean? Today a customer phoned me and said she was rushing to the shop, could I keep it open for her..
She and her husband drove as fast as they could, so as not to inconvenience me! I am still amazed that people do this, when they could just pop in to the supermarket.. Why? These are our people. They trust ME, their farmer. It is totally heartwarming to think that people understand what it means to be truly free range and humanely grown. Today my heart is soring, I am making a difference, I am providing something that people are looking for! My customers explained to me that they are CONSCIOUS EATERS! They are not at all radical in their ideas, they just really believe in supporting local wherever possible and KNOWING that their meat is humanely reared and most importantly, Humanely Harvested. We are taking a bit of strain at the moment with the state of the economy, and I understand that January is always a difficult month, but unlike a supermarket chain, I actually care! I realize how tight things are, we have had 2 BIG scam attempts this week. “I’m phoning from Epol head office, we are changing our bank details” YEAH RIGHT! Then, someone ordered, the order just looked weird to deliver into the location. He order R2,000 of goods, and send me a (forged) proof of payment for R12,000.. asking for a R10,000 refund. Thank goodness I am savvy with all to do on the internet. PEOPLE ARE DESPERATE! Keep up your CONCIOUS EATING, no matter what. It is just simply the right thing to do! 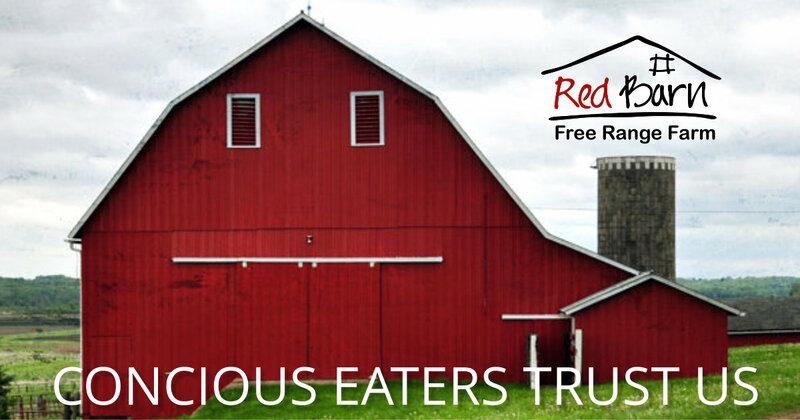 Think of a beautiful RED Barn like this one, and you won’t forget our name! https://www.redbarn.co.za/wp-content/uploads/2019/01/concious-eaters-trust-red-barn-blog.jpg 263 500 Lindy https://www.redbarn.co.za/wp-content/uploads/2018/09/top-logo-red-barn-e1533460146620.png Lindy2019-01-24 19:09:062019-01-24 19:33:01Conscious Meat Eater - what does that mean? Free Range Food Shop! Click Here! We are open on the farm on all public holidays except Christmas Day. So please come and visit us!